Greg writes, In Outlook Express I sometimes get music with the message. Is there a way to grab the music from the message? Such as MIDI,MP3 and WAV. Some of the music is really neat and I would really like to save it. To locate and save an audio file embedded in an email message, you need to discover the source of the audio file. Typically, the source location is a Web address on the Internet, although occasionally the file is attached to the actual email message. If the file is attached to the message, you can easily save the attachment. For embedded files, you need to do some detective work. From your Outlook Express Inbox, right-click the message with the audio file in the list of messages and choose Properties from the menu. On the Details tab, click on the Message Source button. Microsoft doesn't provide a way to search the source, so you need to copy the contents to a text file in something like Notepad. 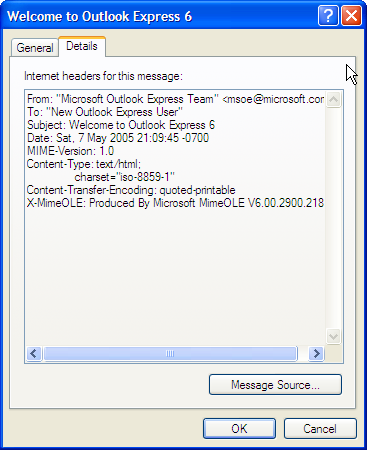 Select all the contents of the message source and paste them into a text file. Open a Find window using Ctrl+F and search for .mp3, .midi, .wma or .wav until you locate the audio file in the message source. You could also scan manually by looking at the source contents which generally takes longer. When you locate the URL for the audio file, which should look like a standard Web address (http://www.domain.com/file.mp3), copy the URL into your browser to locate the audio file and save it.